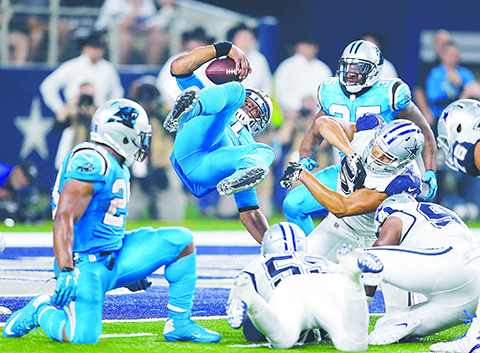 LOS ANGELES: Cam Newton ran for a touchdown and Carolina’s defense scored two more on interceptions as the Panthers improved to 11-0 with a 33-14 rout of the Dallas Cowboys on Thursday. Graham Gano kicked four field goals, including one from 50 yards, for Carolina who were playing on the US Thanksgiving holiday for the first time in franchise history. The Detroit Lions hammered the Philadelphia Eagles 45-14 and in a later game the Green Bay Packers hosted the Chicago Bears as the NFL scheduled three holiday contests on Thursday. The Dallas loss is compounded because star quarterback Tony Romo had to leave the game in the third quarter favoring his left arm following a hard hit by Panthers linebacker Thomas Davis. Carolina’s defense stifled the Cowboys’ attack which included two interceptions by Panther linebacker Luke Kuechly in the second quarter. Carolina safety Kurt Coleman and Kuechly scored interceptions in the first half to give the Panthers a 23-3 lead heading into the third quarter. Panther coach Ron Rivera said they practice plays like those and this time it worked out. “One of the things we do work on is, ‘Hey, we score with the ball,'” Rivera said. “We try to create that picket fence going down one side or the other. “Kurt just made a great cutback and was able to put it in the end zone. Luke knew immediately where he was supposed to go and he picked up a row of blockers.” Newton was superb, connecting on 16-of-27 passes for 183 yards and rushed for 45 yards and a touchdown. Newton led the Panthers on a 14-play, 80-yard touchdown drive to ice the game late in the third quarter. He capped the drive with a four-yard touchdown run with 18 seconds left in the quarter, putting the Panthers ahead 30-6. Romo completed 11-of-21 passes for 106 yards and three interceptions before he left the game. Romo missed seven weeks with a broken clavicle earlier this season and the team said he reinjured the left clavicle. Dallas was 0-7 with Romo out of the lineup. Jay Cutler threw for 200 yards and a score as Chicago held off Green Bay on fourth-and-goal from the 8 with 22 seconds left. Aaron Rodgers’ throw to the end zone deflected off receiver Davante Adams’ hands on the rain. James Jones couldn’t hang on to a potential touchdown catch on third down. Cornerback Tracy Porter intercepted Rodgers’ pass with 3:19 left at the Bears 45 on the Packers’ previous drive. The highlight of the night for Green Bay turned out to be the return of Brett Favre, whose name and No 4 was unveiled at halftime next to the team’s other retired numbers. Chicago (5-6) has won three of its last four. The Packers (7-4) lost a second straight home game. Jeremy Langford ran for a touchdown for Chicago.